Themes/topics: gardening, flowers, creating beauty, sharing beauty, reclaiming vacant lots, patience, making do with what you have, cooperation, faith. Opening Sentences: Rose was a dreamer. An adventurer. She explored the world in her fantastic teapot. Rose collected seeds from each place she visited to remember it by. 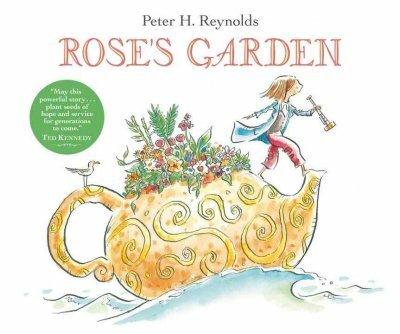 Synopsis: Rose travels all over the world collecting seeds in her teapot boat, then when the boat is so laden it cannot hold any more, she looks for a place to plant her garden. In a city near the sea, she explores and finds a vacant lot that needs some love and some color – but when she gets back to her teapot, birds have eaten nearly all her seeds! Rose’s Garden was inspired by Rose Fitzgerald Kennedy, who was part of the drive to create the network of parks through Boston now known as The Rose Kennedy Greenway. Activities/Resources: One activity for this book would be to plant some flowers and watch their growth cycle, either in a garden plot, or in a plant pot. Kids could make paper flowers, then share them with others – perhaps seniors in nursing homes. This link found at freekidscrafts.com leads to many different paper flower craft projects. Learn about The Rose Kennedy Greenway here. A wonderful animated “Telefable” based on Rose’s Garden is available to read on the Rose Kennedy Greenway website. Be patient, it takes a few seconds to download, but it’s worth it! See if your own community has beautification projects that kids can get involved in. It’s a lovely book, Erik. It’s just loosely inspired by Rose Kennedy’s work in beautifying Boston, but it’s a great tribute to her. Oh how imaginative. This has got to be my favorite. Thanks, Beth. It is a delight. Thanks, Catherine! Beth – this sounds wonderful. I think I’ll find it and then have a tea party with my grandgirls in our ‘secret garden’ and read the book. Thanks for sharing. Oh, I love your idea of the tea party in the ‘secret garden’! That is PERFECT! Thanks, Laura! I love picture books based on true events. I, too, enjoy gardening. Thanks for sharing this special one, Beth! It’s more “inspired” than “based,” but it is a lovely tribute to Rose Kennedy. Thanks, Jarm. This book looks whimsical and lovely. It sounds promising. I will have to check it out! “Whimsical and lovely” are perfect descriptors for it, Heather! Thanks! What a beautiful story based on Rose Kennedy’s efforts to make Boston green. For some reason, I haven’t read this Reynold’s book. And, I didn’t know about what Rose did. Enjoyed the sites you included. Thanks, Pat — it is a lovely book. I’m sure you’d enjoy it. This book sounds fascinating. It’s lovely to know this book was inspired by Rose Kennedy. The Rose Fitzgerald Kennedy Greenway is such a breath of fresh air and beauty compared to what was once there. Thanks, Cathy — it’s a lovely book, and judging from the pictures, the Greenway is a lovely thing in the midst of the city. What a fabulous whimsical tribute to Rose Kennedy. I must get my hands on this. And yes, how funny that we both chose garden stories published by Candlewick in 2009! You will love this book, Joanna! And great minds think alike! I love that she that she has a teapot boat! This sounds like a beautiful story! That’s a very sweet story, Beth. Kind of like a “Mother’s Day” treat read, I thought. Very pretty illustrations too. What a stunning little book! I like that all the kids were “seeds from all over the world”. In Texas we have our own version of Ms Rose. Ladybird Johnson brought beauty to our highways and byways by planting Texas wildflowers like bluebonnets. Thanks so much for sharing this book. I’m going to be looking for it!